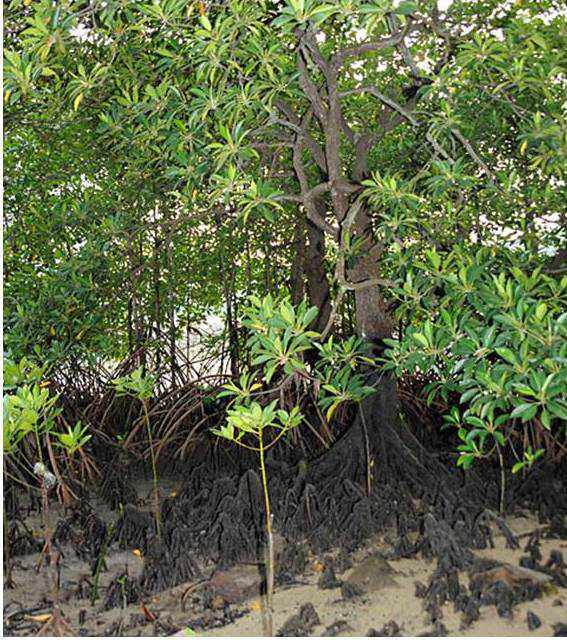 • This species of black mangrove grows from 4-15m in height. • Supported by knee/elbow roots which rise up around the main trunk then curve straight back into the soil. • Leaves are long, slim and hairless coming to a point without a spike. • Flowers are white before fading to a brown. • Seeds are short and fat, usually dark green or brown all over. Germinates on the tree and is shed once mature. Flowering and Fruiting: occurs throughout the year. Uses: Timber is used for building and firewood whilst the bark is used to concoct dyes and medicine. Habitat: only at sea level along mangrove swamps. Distribution: It is one of the most widely distributed trees in the tropics ranging from Africa, Southeast Asia, Australia and throughout the small and large Pacific islands including Samoa, Tonga and Fiji.